The art of sharing experiences in an engaging narrative, or storytelling, has not been lost in the Internet age. In fact, the need for storytelling has amplified as both readers and publishers search hungrily for informative articles as told through first-hand experience. 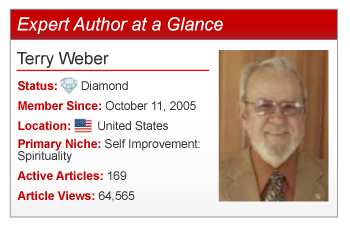 For Expert Author Terry Weber, 70+ years of experience and a passion for writing, balancing story and informative content has been the key to his success. In addition to this focus or theme, Terry imagines the reader sitting down with him to discuss the topic and then pairs the topic with a relevant story to direct the reader in a way that it will make him or her want to read more. “People like to hear interesting stories,” Terry commented. When he first started out in sales writing, Terry said those stories were about customers, their problems, and the solutions.” Using the same principle, Terry writes articles by incorporating a story to initially capture the interest and then hold that attention all the way to the very last word. Try Terry’s methods to write engaging articles readers crave. Think before you write, incorporate story, and above all, be enthusiastic about your writing. In doing so, not only will you arouse your reader’s interest, you will build trust in your brand and encourage action! Do you have a question or comment for Terry? Feel free to leave it in the comments section below. Thank you for the helpful advice! I’ve written a book (on Word) and burned it onto a CD. Can you help me with the next step??? It’s basically about my childhood – but not a dull book (in my humble opinion). One thing my parents would not allow in their home – boredom! I’m also a diamond author with Ezines Articles! I’ve written about my journey with diabetes and maintain a blog as well. So much writing – but I love it! It sounds like you are already an accomplished author, good for you. Congratulations. Now you need to get your book published. I suggest you go to: Smashwords.com There you can learn exactly how to have your book become an ebook. They even help you make some money when your book is sold. There is no cost to use Smashwords.com. You will need a good, attractive cover. I used a cover artist with the following address: missmaesite@gmail.com I paid her $50. for one of my covers. Fantastic article. Thanks for the post! Thanks. Now the “ball” is in your court. How and when will you handle it so it works for you? What an excellent approach! I especially like the idea of starting with a guiding word concept. It reminds me of Edgar Allen Poe’s Single Effect Theory for writing short stories. I bet I could learn a lot just by reading Terry’s articles. Thanks for this great pointer! Thanks for the Smashwords.com link. It is impressive that you have all this in place. Maybe I should do the same. Never thought of it. Looks like it might work well. Happy Writing to you. See my reply to Linda (here) with more info about Smashkwords. BTW when thinking about words you could think about your last name…how come the spelling, where did it come from, what is the story behind that name, think then write about it. How I wish I never had to thinkabout that dreadful name. It’s a scream! lol I have wondered about that, though. Terry Chestnut, maybe you wouldn’t feel that way if you researched the name. And wonder makes for good writing too. Ezine has mentioned several times that articles about one’s own experiences ae acceptable,but when I send in one like that, it doesn’t seem to work. I am 87 years old with a vast experiences in many fields. I am writing my memoirs and I have taught memoir writing. I have made some history and I have seen some history. I actually have several niches I could use. I am living with cancer and have written 3 articles about that experience. Maybe I don’t have the balance that you mention, Terry Weber. Your article is encouraging and I appreciate your sharing it with us. Gees, Opal Marrs! 87 is terrific. Been there, done that for sure. And you mind seems quite clear as well. Excellent. If you don’t mind, please post about the history you made. Did not mean to get distracted. I second what Dr. Erica Goodstone pointed out and suggests. You both have a great handle on it all. Sounds as if you and your wife had a really exciting and adventurous number of years. What is wonderful about writing is that you can continue to do it at any age, no matter what is going on for you physically. One lady that I interviewed on my blogtalkradio show, Healthy Baby Boomers Network, Susan Crain Bakos, wrote a series of blogs about living with cancer. She refused to take any treatment and chose instead to just live her life until she couldn’t. Would you like to be interviewed on my radio show? You have a wealth of adventures and insights to share. Your approach is often used in meditation – to concentrate on a specific word and explore its meaning. So you are describing a type of meditative writing, where your thoughts take over and guide you and then you can easily write. I find it write best when I feel stimulated by an idea, an event, a topic, but usually not just one word. I will try that to see what I create. I never thought of my “method” as meditation, but I guess you could call it that since I do lots of praying for God’s wisdom in my life. I often hear from Him during the dreams I have at night when my super conscious mind takes over my daily conscious mind and I wake up with new, creative ideas for articles (and inventions). Thanks for the invitation to be with you on your radio show. I’m sure you are careful who you invite to participate there. I’m not much of a “talker” but I will think about your invitation…and put it on hold for now. now hard for me to read and write. My vision seems to be improving a bit each day. One of the benefits of hindered vision (and now limited reading and writing) is that I have more time for independent, creative thinking. I’m simply trusting the Lord to guide me. My thoughts and prayers are with you for a full and speedy recovery, although you seem to be looking on the bright side and seeing the benefits that you can find. At any point, if you feel inspired to talk about your life and writing and healing experiences, please feel free to contact me. I would enjoy talking with you on the radio show. Terry C, thanks for wanting to hear more from me – I am flattered. My experiences have so far filled two binders. I have had two retirements, one from the Social Security Administration and the Administration on Aging and the other from the real estate business as Executive Officer of two Boards of REALTORS. I also served in an engineer and topographic company in post-WWII in the Army of Occupation in Germany with my soldier husband. Yes, my mind is even sharper now than it ever was, thank the Lord, and I am almost as active as ever. I have 8 grandchildren, 19 geat-grandchildren and 4 great-great-grancchildren all, of course, smart and beautiful. I brought up 3 biological children and adopted two more when I was 48, held a full-time traveling job and went to college at night making a 3.75 average and my name was on the dean’s list and even on the marquee at Cowboy Stadium in Irving, Texas. What a life. I am enjoying my journey here. Terrific, Opal Marrs. I am glad you lived fully and successfully. Now you are a good example, like Terry Weber and the good doctor, for the younger people. While raising our 11 children my wife and I learned that “teaching by example” is the only way. When we were building houses with Habitat For Humanity we often taught the new homeowners how to take care of their new homes by showing them what to do. They leaded those little home maintenance jobs very quickly – by watching what we did. Is Habitat For Humanity the one run by Jimmy Carter? I have heard of it, it seems, and it impressed me much with the way the recipient participates in the construction of his new home. He possibly learns some new skills and gets job experience included with a high quality place to live, that he owns. Nice idea as long as their are people like you and your wife to make it happen with your parts. It must be great for the recipients. Thanks for doing that. Jimmy Carter has endorsed Habitat but does not run it. At one build JC told us: ” You all can stand here and talk after our prayers together, but I came here to help build a house – not stand around and talk. So excuse me while I go drive some nails.” The candidates for a Habitat home must put in at least 500 hours of “sweat equity” on their new home. Then they get an interest-free 30 yr. mortgage with no down payment. We worked with lots of new home owners and they were always very glad to finally get a brand new home of their own after paying money-hungry landlords for so many years. Habitat is a hand-up not a hand-out program where the government is not involved in any way. New owner’s kids got a nice place to live in rooms they could call their own in fact, they got a whole new life in a good neighborhood when they moved into their Habitat house. Habitat still builds homes all over the world on about the same terms. I could go on and on about Habitat, but I won’t. They still need volunteers (experienced or not). Beautiful. I did not that much about it before. I am glad you are promoting it. There is nothing more beautiful than writing in its simplest and barest form. This is beauty at its best. John Steinbeck is my favorite example of that. It is amazing how simple, and clear, his Nobel Prize winning writing is. I agree, we can all do that when we take the time to think before we write. In fact, what we need to do is try to create or draw a “word painting” so readers can almost “see” what we are talking about. yes, they say generous use of ‘imagery” is very effective. I usually write about idea without regard to imagery but I might be well advised to keep it in mind during my next project. Thank you. I have noticed you have a lot of successful experience in copy writing. I am very interested in learning this extremely valuable skill and hope you have posted on the topic for your readers. I have not posted anything on the subject of copy writing. Shucks. If you ever do I will read it for sure. Thanks for the heads up. Terry C: You mentioned John Steinbeck. His forte was description – I could picture his characters. He varied the length of his sentences and I admire that kind of variety. He also had a way with dialogue. I never could get bored with his style. Sentence structure is important to me, but it requires attention to the proper use of modifiers and punctuation marks at the right place . Thanks Opal. A deep grasp of Steinbeck’s writing technique would benefit most of us quite a lot, I believe. I am glad you added some depth towards that understanding. Too bad he is not here to post with us at EzineArticles. In my opinion, all good writing is original with the writer. How he/she arranges those thoughts on paper is unique to that writer. An author or writer gets an idea, thinks about it for a time. He may read Steinbeck, Poe and Frost to find out what ideas they had. But, then, since a writer can only be himself (I can only be Terry Weber) the words that I allow to flow on to paper are my words. Not Steinbeck, Not Poe, Not Frost. This makes me proud of what I write. I may pick up thoughts from others but the resulting words have to be “mine.” I want my writing to sound like something Terry Weber wrote – not some by some other author and you should do the same. We are all uniquely indiviculistic. We can learn from others but we should not try to be copycats. We need to strive for our own originality. I don’t copycat and didn’t mean to say anyone should or could. I like to think I have my own ‘writers voice’. Not an original concept but points to a unique aspect of anyone’s writing. Thanks. For what is is worth, the only original writing is probably the 10 Commandments. All the rest are taken from somewhere else, given a spin or a different perspective by the writer. Even researchers who are expected to come up with “original” pieces of work, have, as basis, somebody else’s work for the research. So let’s not agonize over this, okay? I agree. But the spirit of the writer sometimes sets his writing apart, or at least makes it recognizable as his. There are probably other people a lot like us but they are never us. Remember the saying, “the singer, not the song? Same is true with writing. Think of this: there is only one “word” of God. But do you know how many versions are there of the Bible? Last time I was in a Bible study class, the priest, blowing his ego, brought along 6 versions. If they cannot agree on the “word” of God, I will walk the lonely path to salvation. Even that is not original. So right you are! One of my sons , a college professor, is a researcher of the Dead Sea Scrolls. He has found what you say to be true. Whatever is found always seems to date back to something previously written. But, originality for me is simply something I though up on my own. Perhaps I read what I write somewhere else but the source is long forgotten (by me). So I think it is” original”. It’s probably true that there is nothing new under the sun, we just think it is new when it is actually something long forgotten. Still, I keep on trying to say things in new and better ways to keep my readers interested in reading my article. My purpose is to help them understand my subject and my point of view to benefit them in some new way. I believe we are all born “creative.” We have creativity in our DNA because we are sons and daughter of the Lord our God. He, our Heavenly Father, is constantly demonstrating His creativity to us. He has given us a free will to either use our creativity or not. I always think that the safety pin used to be a twig to keep things together and the IC used to be those huge vacuum tubes. Just imagine what this world would be like if people don’t build on something done before for the reason that it isn’t new? A blogger claims to earn thousands of dollars writing motivational tips. And he claims that his articles are 100% original. What bull. You could not write motivational tips if you spend the greater part of your day in front of your pc writing articles. You have to go out there and rub elbows with people., getting into the fray of human interaction. There is very little that is original unless you are an Isaac Newton or Sigmund Freud, frankly, no matter how insistent some people are for “original” material. Charles Darwin will be right in with his latest insight of the century, no doubt. We look silly, and ignorant, when we posture like that and we fool no one but ourselves. We really should realize. I don’t know about you but my EzinesArticles articles always have a purpose. That purpose can be: change a mind, improve understanding, persuade to buy, introduce a new idea, product or thought to the benefit my readers, try to clarify thinking, help readers overcome obstacles, entertain, introduce ideas that demonstrate how much fun is available to all of us each day. When possible, I try to make my readers laugh out loud or – at least – smile broadly! If I can find a way to make my writing memorable I will do that too. Sometimes my writing is sentimental, other times – frivolous or merely helpful. Hopefully, my writing is never dull. Thanks for a great list of purposes for articles. I will refer to it often. The parts of any article are: #1 is the beginning. #2 is the middle. #3 is the end. I really liked as need to about the information that you have provided to Ms. Turner about publishing of e-book via Smashworks.com as I myself I have need to be published as an ebook. Your suggestions about thinking first, telling a story and being enthusiastic are among the best I’ve ever encountered on how to maintain a productive writing schedule. Thank you for sharing your knowledge and expertise in such a generous way. You are very welcome, I’m happy to be able to help you. Let me know if you have any questions. Thanks for the 2nd invitation. I think I need a little more time to recover re: the radio talk show. I do have stories to tell – sometime. Can we do the radio interview on the phone or does it need to be in person? – LOL! I so understand the ouftit choices. My 5yo son chooses all his own. Usually he’s pretty good. But there are those times of 2 different plaids and other such combinations. Very cute swing pic! Love the color.